Have you heard of the 3 B’s? Bath, book, and bed. It’s a simple routine that’s great to use each night. Kids thrive off consistency and having routines is important. A bedtime routine is especially helpful because it gives your child cues that it is almost time for them to go to bed. But what other activities can you do? What about the time you spend with your child before bath time? Evenings are great opportunities to spend quality time as a family, especially if your little ones are in school during the day. 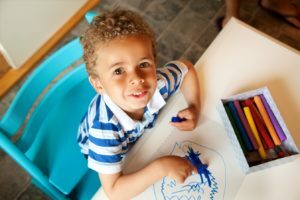 You will want to pick activities that will help your child wind down in the evenings before starting the bed time routine, so we came up with a few ideas to get you started. 1) Coloring and Painting – Ask your little one to draw a picture of something they did at school today. When they are finished be sure to ask questions about that and other things they did. Drawing and coloring is a great time to develop communication. Ask questions about what is in the picture to help develop vocabulary. If they draw your family you could ask: Is dad short or tall? What color is mom’s shirt? Are there pets in the picture? What is everyone doing? 2) Puzzles – Puzzles can help communication, fine motor, and working memory development. You can even make your own puzzles by drawing pictures and then cutting them into different shaped pieces. 3) Story Time – If you don’t already have books into your nightly routine, try adding it in right away! Whether it’s independent reading or reading aloud as a family, reading at night is a habit you want to start early. This is something they can continue throughout their lives. To make it especially fun and special, try creating a reading nook or fort with blankets to give them a quiet space for reading stories. 4) Use Your Imagination – If you are trying to cut back on screen time, especially before bed, that doesn’t mean you can’t use television or games to your advantage. Talk about your child’s favorite character and encourage them to dream up their own storylines. If Elsa from Frozen and Marshall from Paw Patrol spent the day together, what would they do? If they both came over to your house for dinner, what would you talk to them about? This is great to do when reading as well. After the book ends, ask your child questions to see if they can keep the story going. 5) Play with Putty – This sensory experience doubles as a wind down activity because they are sitting still while playing and experiencing the texture of the putty. Make the putty into different shapes and objects. 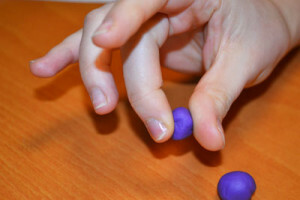 For ideas to get fine motor practice or for a putty recipe, check out our DIY Putty post. 6) Yoga and Stretching – Both yoga and stretching are ways to help you and your child relax. Play some quiet music during this time for an added calming touch. While improving flexibility, stretching will also help you relax. Since you should hold stretches for 20 to 30 seconds, this helps your little one slow their body down after activities when they are running around. Yoga can have the same benefit. Have your child rename some of the poses to add some silly fun! If you find yourself struggling to get your kiddos to go to bed, try including “wind down” time in your nightly routine. Each of these calming activities is great for spending quality time together as a family in the evenings, but they can be used anytime. You may find them especially helpful when trying to have some quiet time before or after a lot of people are around. 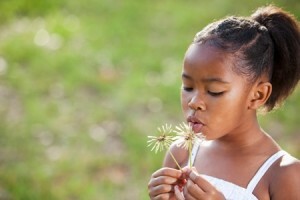 Get outside with these fun activities for kids! Learn about the stages of play your child goes through as they develop play and social skills.